I am an Australian working in Papua New Guinea (PNG) in Bible translation and linguistics. Before I moved here I worked on traditional sailing ships doing sail training, and shared life with friends through our variation on intentional Christian community living. Disclaimer: The views expressed here do not necessarily reflect the opinion of any of the organisations mentioned. Four months in PNG have passed quickly and gone well. Most of this time has been spent in Alotau, Milne Bay Province. I’ve often heard this called the peaceful province or the friendly province and I have found it to be both. This peaceful reputation means we currently have a collection of newly elected members of parliament visiting to meet, discuss and hopefully form a stable government through a coalition. Alotau is a regional centre built between mountains and sea. It is generally less than a kilometre before the land rises steeply, blanketed in jungle. 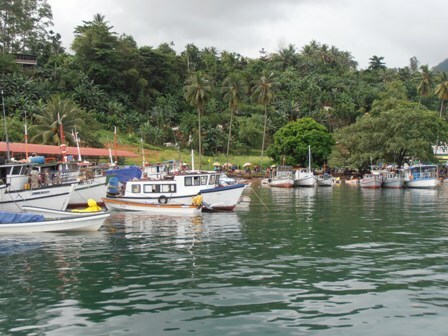 The harbour is the heart of Alotau. It is where the traffic of the province comes and goes from. People come and go, market goods arrive and store goods leave. There are also two commercial wharves for oil tankers and container ships. Dinghies take passengers to many places, work boats go further afield. PMVs (Public Motor Vehicles) connect up land routes to East Cape, Awaiyama and other places. From there you can catch a dinghy onwards. There are always groups of people waiting with their things for a PMV or a dinghy. There are also groups of people waiting…for I’m not sure what. Waiting for friends, waiting for family, waiting for something to happen, waiting to see what strange things the dimdims will do next. Town is rarely without a small crowd, which becomes a big crowd on pay fortnight. The shopping strip in Alotau is maybe 200m long, with supermarkets, general stores, hardware, pharmacy, banks and post office on either side of the road. There is a second street of shops, but it is much quieter. The shops have most things, sometimes. Other times, the answer is ‘Sorry, no stock’. Apparently town ran out of sugar last week, but a new shipment has now arrived. The fresh produce market varies daily for produce variety, quality and cost. Since I have been here pineapple have gone out of season, but guava and soursob have come in, fruits I’ve discovered I very much like. One end of the market is for fish; mostly smoked, some fresh. Behind the covered section of stalls is the market for betel nut, mustard and lime. It is also the largest section of the market. These three are chewed in combination as a mild stimulant. Although people joke about them as ‘PNG PK’ (chewing gum), they lead to gum disease and other problems. We’ve been having patches of the town water or power supply being turned off. There are notices up in town that one of the pumps for the town water is broken and they are waiting for a new part to arrive. Other notices inform that power will be interrupted over the coming weeks. Mostly we have had reliable water and power, so these interruptions are not the norm, yet neither are they uncommon. Our centre is prepared for these intervals of interruptions with a supply of tank water and a generator to turn on and off as needed. 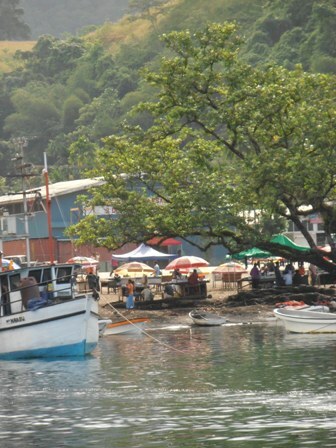 Milne Bay was part of the English colony of Papua and as such has continued to have English as its language of wider communication. 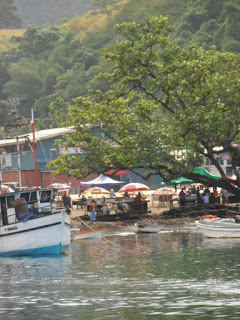 Tok Pisin use is slowly increasing, as people migrate to here from other regions, but Milne Bay English remains much more common. This has made my life easier as I’ve not had to learn another language while learning another culture. I’ve been learning a lot about English dialects though, as Milne Bay has it’s variation, as do my colleagues from the USA or the variations of ESL from other colleagues. On Friday (Aug 3) I move on from this region to attend POC (Pacific Orientation Course) near Madang. There I will be learning Tok Pisin as well as much more about the culture of this country. It will be interesting to see other areas of PNG and compare them to my experience here. Ooh, please explain what a 'soursob' fruit is...in S.A, that name was giveb to 'Oxalis', that pretty yellow-trumpet-flowered poisonous weed- I suspect not the same thing! Recipe Challenge: Picking it up again! I wish I could lead three parallel lives. One on land in Australia with my family and friends. One at sea on tall ships. One overseas involved in Bible translation. But there is only one of me, so I keep myself busy instead, squeezing as much into life as I can.